Please click on the PDF below to take a look at our range of packages, or customise your own boat with our sailing, colour and fit-out options. 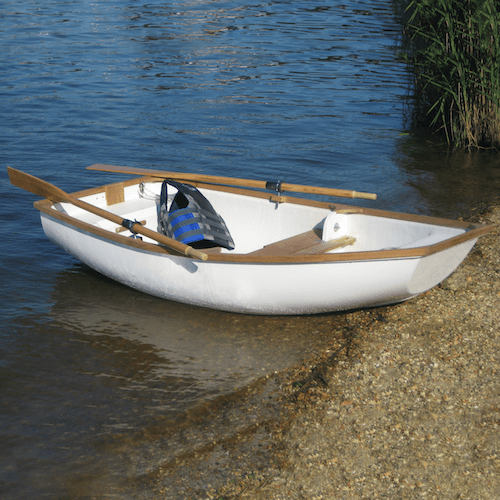 Our popular Nesting Pram Dinghy is 8ft 2″ long assembled, but only needs a space measuring 4ft 8″ long, by 4ft 3″ wide, to store. A suitable space can be found on the deck of most yachts over about 30ft, on top of Minis, or in the back of a saloon car. The assembled Pram is 8’2″ (2.5m) long; the nested length 4’8″ (1.43m) and maximum beam 4’3″ (1.33m) tapering to 3’3″ (1m) at the stern. There are buoyancy tanks at both ends and the option of a longitudinal seat in the stern section helps give you the best balance between different loads. 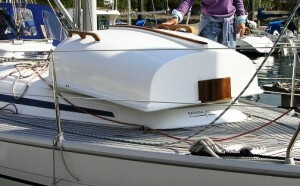 The hull is made from glass fibre with wood trim; with many options to customise the fitout – including teak-decked buoyancy tanks, rubber fendering etc as shown here. She is a delight to row, far outperforming most inflatable and folding boats, tracking straight but turning on a sixpence when you need her to. If you are used to an inflatable, with one of our Pram Dinghies you will discover (or re-discover) that rowing can actually be a pleasant experience, and it will become something you do of choice rather than necessity. On many occasions it is also quicker to row ashore than fiddle about with the outboard, finding the petrol can etc. 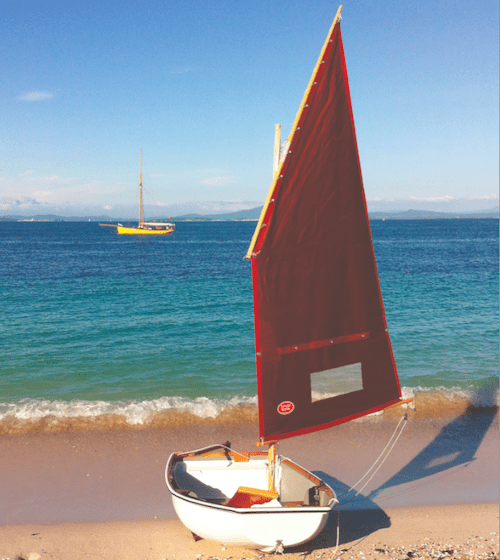 The optional lugsail can be rigged either as a boomless “standing lug” – great for teaching kids or grandkids to sail – or a boomed “balanced lug” for a bit more performance. The boom actually makes most difference off the wind, rather than going to windward – it’s mainly a poling out spar. It’s a lot of fun and, whilst not aimed at racing, leaves most people pleasantly surprised. 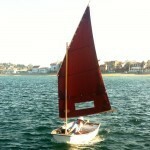 The mast is free-standing for quick, easy assembly (no fiddly shrouds and stays). See the slideshow to the right for more images. The lug rig was chosen because it has a low centre of effort compared to the same sail area on a Bermudan rig – ie less heeling force – but in the words of one customer, also “pulls like a train!”. Because the hull is solid the rig’s power is converted into forward motion, rather than flexing. 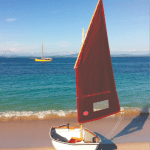 Pram with balanced lugsail rig, North coast of Spain. Note also optional joint in mast. Same sail can be used without boom for extra safety. Tender to Mischief (Pilot Cutter in background). 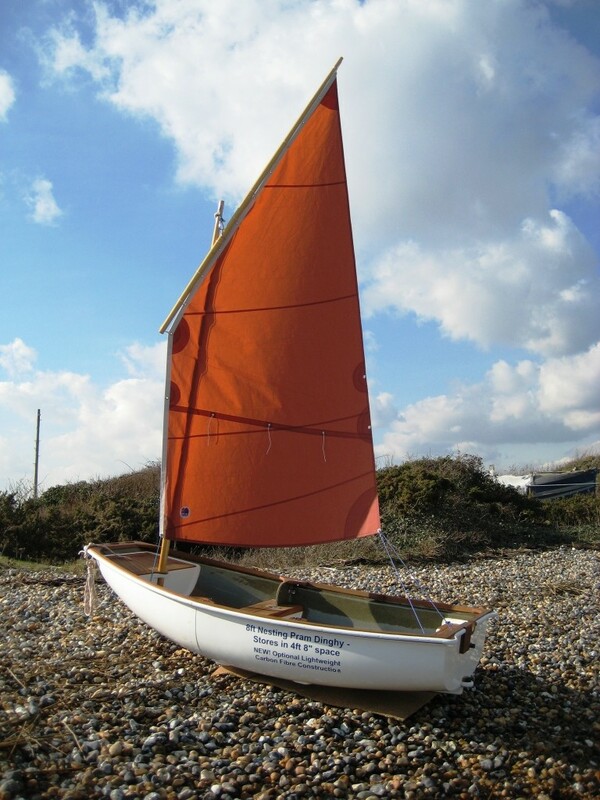 This Nestaway 8ft two-section Pram dinghy has the optional 36 square foot balanced lugsail rig. If you want to motor she only needs a small amount of power to drive her along at displacement speeds. Motors of this size are much lighter and easier to handle, cheaper to buy and more economical to run, than the larger motors that tend to go with inflatables. In a test by Yachting Monthly, she achieved just under five knots with a 2.3hp Honda and two passengers. 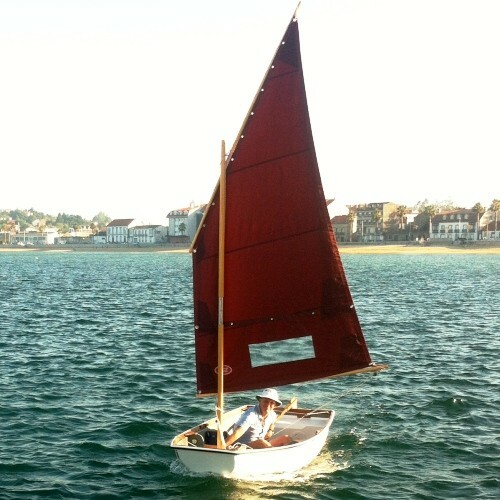 We’ve had eight knots from 3.5hp, with just the driver on board, although it was a triumph of brute force over hydrodynamics (it is not a planing hull)! 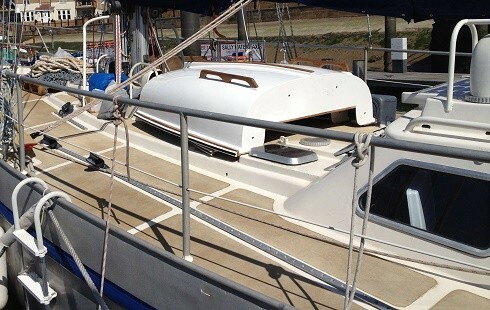 Her flared bow will keep you much drier than most inflatables, deflecting spray and waves outwards. The easily-driven hull also means that you will go faster or further or both if you choose an electric motor (such as the Torqeedo electric outboards we sell) – perfect for watching wildlife in peace and quiet. The fact that she rows so easily is also of great reassurance if you are worried about battery life. Easily-driven, stable and dry under power. 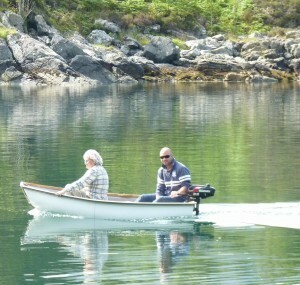 A tiller extension (pictured right) gives better fore and aft trim if you are motoring on your own. For help and expert advice. Call 0800 999 2535 (free from landlines). Email mail@nestawayboats.com. Or click ‘Contact Us’ to send a message online. With her moulded glassfibre hull and wooden trim the standard Pram weighs about 46kg (100-lb) – similar to a good quality inflatable with a hard floor. Once dismantled the sections can of course be moved around separately, making it very easy for two people and possible for many reasonably fit adults on their own, with the right technique. 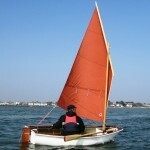 She’s a fairly beamy shape, with lots of stability and load carrying ability for an 8ft dinghy. 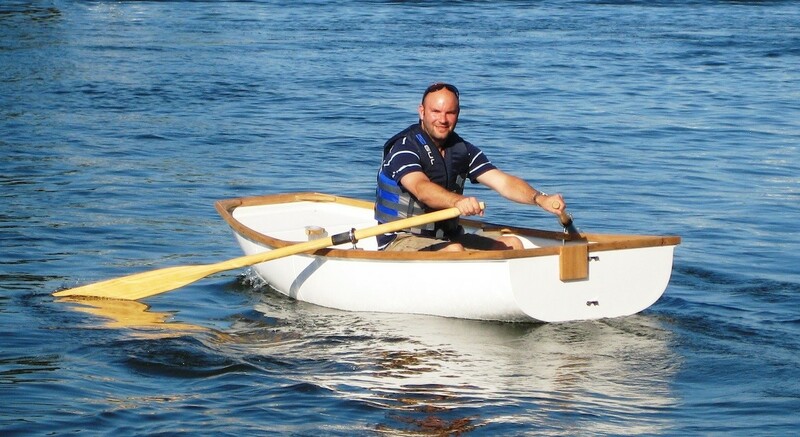 There is enough length in the aft section that the passenger’s legs won’t clash with the rower’s – in other dinghies this can be an amusing problem at first, but gets to be annoying on a daily basis. The optional longitudinal stern seat further helps with load balancing. It’s particularly useful motoring one-up, when the stern buoyancy tank is really too far aft, and the centre thwart too far forward. With air buoyancy chambers fore and aft, there is sufficient buoyancy to keep the hull afloat even if fully swamped. Additional buoyancy bags can be fitted. 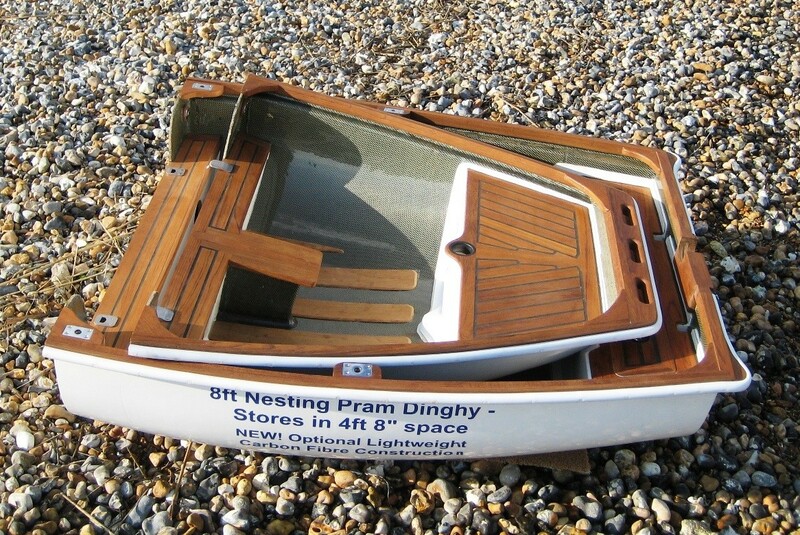 Most of our Pram Dinghies are sold as yacht tenders, generally for storage upside down on deck. As a general guide the nested hull will fit on the foredeck or coachroof of most yachts from about 30ft and up. 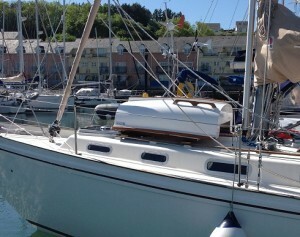 She is shown, top right, on the foredeck of a Bavaria 36, still with plenty of room to either side so that you can get forward. 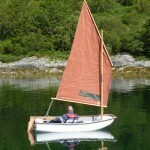 Note also the optional bilge keels/handles on the stern section: these are a convenient way to tie the dinghy down, and just the right height to hold onto as you walk past. 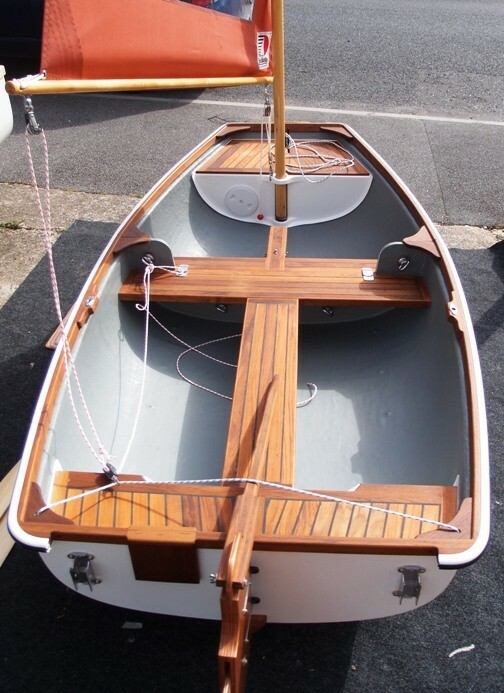 This Pram also has the optional teak keel band, a good compromise between protecting the dinghy and not damaging the yacht’s deck (as a metal band might, particularly when gouged etc). In this picture, right, a Pram is shown being dismantled on deck prior to nesting. The easiest way to launch/retrieve – certainly in calm weather – is a halyard to the towing eye and lifting the boat vertically. Not very dignified perhaps, but effective and quick! 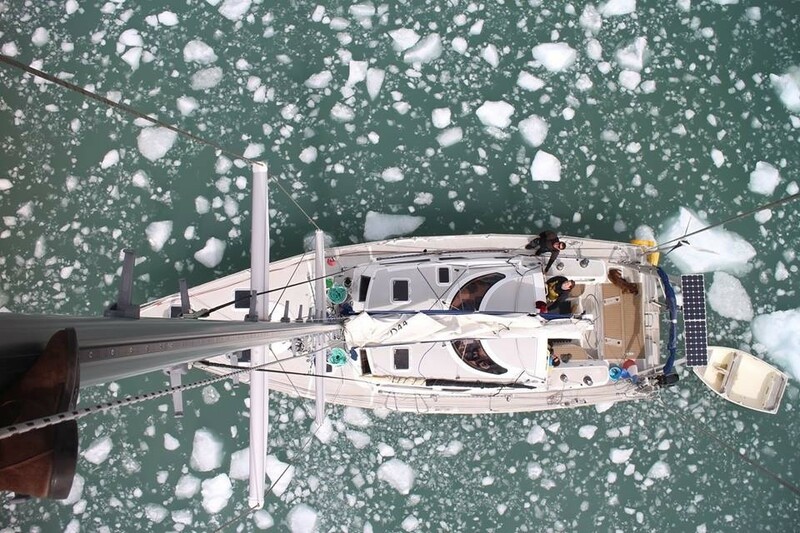 As few yachts have a completely clear span of deck measuring 4’8″x4’3″, you need to be able to work out how the dinghy will fit around the various protuberances such as hatches and vents. This pdf diagram – Nesting Pram dinghy dimensions – should help. But please be warned, we are boatbuilders, not artists! – The cutaways at the joining bulkheads (down to thwart level) give approximately 6″ clearance above the deck when stored upside down, which is plenty for most hatches etc (even allowing partial opening of hatches when desirable). – The combined fore/aft length of the two thwarts is approx 12″. 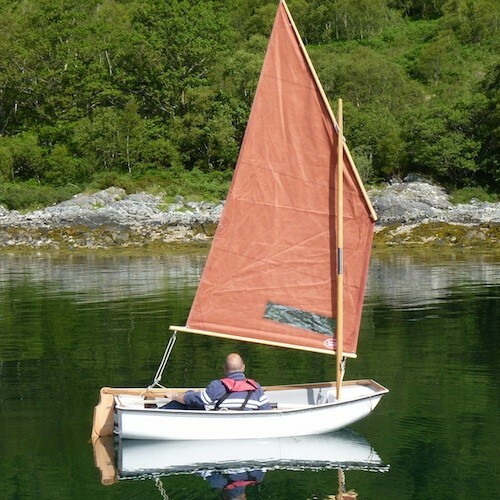 – In Pram dinghies without a daggerboard case, there is an empty area in the bow section, between the centre thwart and buoyancy tank, of just under 2ft long and at least 14″ deep. This will clear most types of ventilator, winch, cleat etc. 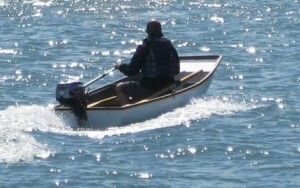 – In boats with a daggerboard case the case is central in the bow section, extending forward 10″ from the thwart (approx 4″ wide) into the clear area mentioned above. – Forward of the clear area are the buoyancy tanks, giving about 2″ clearance over the deck. If you have any specific questions please do not hesitate to ask. Above: coachroof between mast and saloon windows. Many customers carry the 8ft Pram on the back of a camper van / motorhome, or even inside the garage found at the back of some of the larger “RVs”. 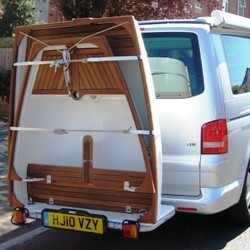 This picture shows a Pram Dinghy on a VW Transporter camper, bolted to one of our special towbar-mount platforms. It’s only a foot or so above the ground, and you only load half at a time – so it’s much easier than getting a single-piece boat up on the roof. 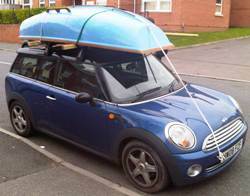 If you do need to get it on a car roof for transport purposes, lifting it there is OK for two adults. The Pram is actually quite aerodynamic upside down and when we need to put one on top of our van – because the inside is full, going to shows etc – we notice little if any difference in fuel economy! 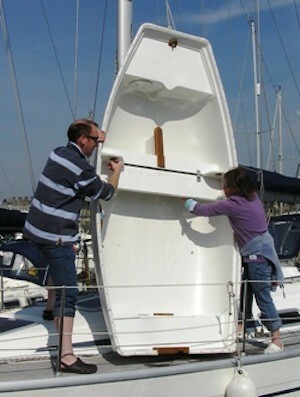 The stern section bilge keels/handles make useful tie-down points, guaranteeing a strap can’t slip. 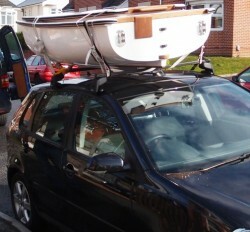 Another option for cars with a relatively short span between the roof bars (the car in the bottom photo is a 2008 VW Polo hatchback) is to carry the Pram dinghy nested right way up. You obviously need to be a bit careful about doing this in rain – she will potentially fill up to the lower bolt holes, which is quite a lot of water – but this massively reduces the overhangs front and back, making for a very stable load. Please tie down securely! 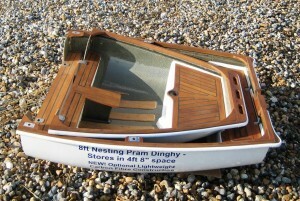 We should explain the name “Pram Dinghy”. It’s to do with the shape of the bow, which gives more volume and load capacity within a shorter length. With enough “rocker”, or vertical curve in the keel line, and “flare” at the bow, they are very seaworthy and dinghies of this type and size were once commonplace. If you are after a space-saving tender, it seems like a logical place to start – the Pram is a much “bigger” boat than many other 8 footers (eg Walker Bay 8). Many people ask about the effect of having a split in the middle, but in fact the bulkheads and centre thwarts make her stronger than a non-nesting boat. Assembly – by first hooking, then bolting the sections together – takes less than a minute. 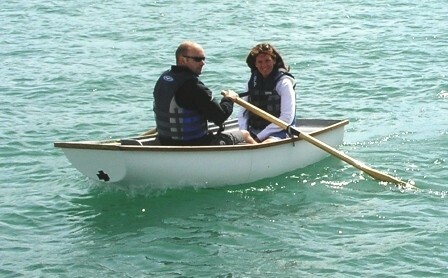 We are occasionally asked for smaller dinghies. In our experience an 8ft Pram is the smallest “useful” tender, that has or retains any kind of performance when carrying typical loads. 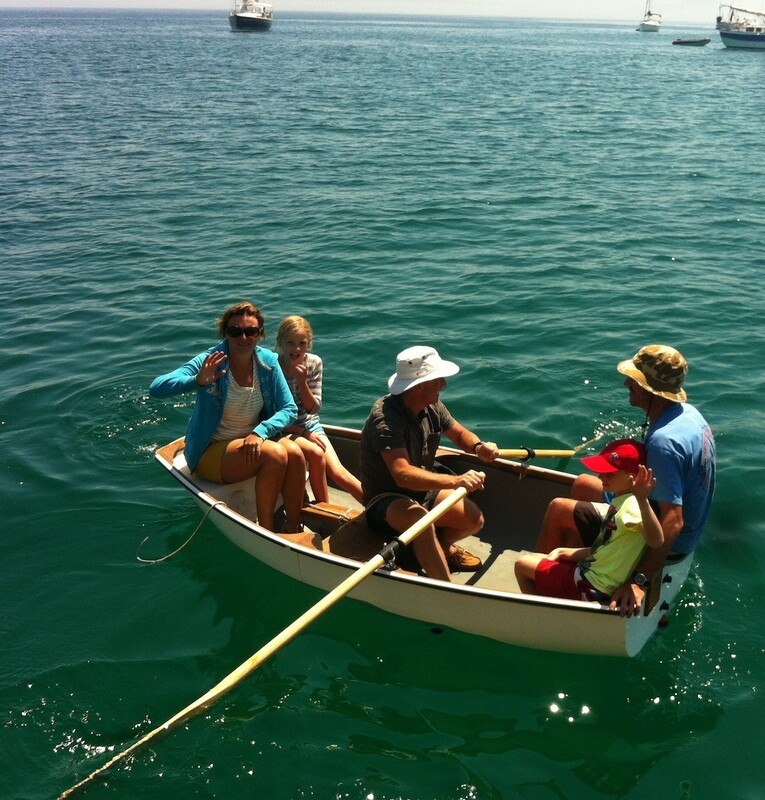 The 6ft Pram dinghies offered by some should really be sold as one-person or childrens’ boats – and even with one person on board many are not particularly confidence-inspiring or pleasant to use. And of course – we hardly need point out! – our 8ft Pram, nested, fits in a much smaller space than any of them. Also bear in mind, if looking at boat shows, that boats always look bigger on land… in the water, in a slight chop, you will be very glad of the extra couple of feet in length, 6″ or so in beam, and 3-4″ of freeboard, compared to a 6ft. Call 0800 999 2535 (free from UK landlines). Email mail@nestawayboats.com. Or click ‘Contact Us’ to send a message online. 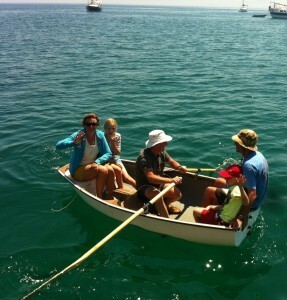 Customer photo: 8ft Pram in the icebergs, Patagonia.